Riding in a car or truck should be a smooth, seamless feeling. Yet, over time with wear, hitting curbs, and driving on a variety of terrains can throw off the suspension and change the feeling of the ride. Sometimes a simple alignment is all you need but not always. A bad wheel bearing can have similar effects that poor alignment produces. Know the difference between wheel alignments and car wheel bearings and how each can be resolved to restore your comfortable ride. Alignment refers to the geometry of the entire suspension system. The system is comprised of control arms, steering components, and mounting points designed to fit in exact places. Perfect geometry is vital to ensure all four tires work together, meaning they need to be able to rotate in the same direction at the same speed. Once parts of this system fall out of place, even slightly, the alignment of the suspension is changed. 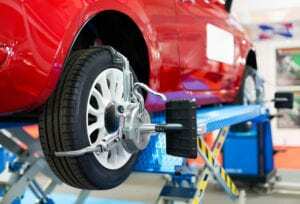 Poor alignment can result in accelerated tire wear or damage. Due to the vulnerabilities of the metal components in the make-up of the system, hitting potholes or curbs can change the shape, pushing the alignment out of place. Additionally, joint components and rubber bushings deteriorate making them ineffective. When a vehicle receives an alignment, a technician will check three different angles of the vehicle’s alignment in order to properly align the wheels. These three angles include: camber, toe, and caster. Camber has to do with the vertical slope or angle of the wheels. The camber may be off if the wheels are positioned at an incorrect angle on the road. Toe has to do with the direction in which the wheels are rolling. All four wheels must roll in the same direction simultaneously. Caster refers to the balancing angle in relation to the vehicle’s weight and steering. Similar to a bicycle’s front and forks protruding forward. Too much or too little caster makes controlling the vehicle much more difficult and may cause the vehicle to drift. When a technician performs an alignment, the vehicle is hooked up to an intuitive machine and takes measurements on the position of each wheel. The results will provide details on the current alignment and what adjustment or repairs may be needed to put the suspension back to the manufacturer’s specifications. Wheel bearings is a set of steel balls that are held together by a cage and a metal ring called a “race.” Their purpose is to help the wheels spin and reduce friction. Bearings are positioned on a metal axle shaft within the hollow metal piece in the center of the wheel, also known as the hub. The hub is the apparatus that holds the lug nuts used in bolting the tires to the wheel. They are required to hold the weight of the vehicle while traveling over all terrains as well as accept the parallel forces of corners all while permitting the wheel to spin at thousands of resolutions per minute. Because of their proximity to the road, they must be sealed units to keep road dust, debris, and water out. Because wheel bearings are performing so much work, after driving for thousands of miles, they can wear out. Constant revolutions paired with the weight of the vehicle causes wear to even top of the line bearings. In older cars, wheel bearings were a set of narrow roller bearings on a non-drive wheel or a straight bearing that supports the axle of the drive wheel. Vehicles today, however, are equipped with a sealed unit bearing that is bolted or adhered to the hub or knuckle. The unit is sealed to keep contamination out and prevent premature wear and cannot be serviced. This can also be a drawback as they cannot be cleaned or greased. Once the unit is worn, the whole bearing and sometimes the hub must be replaced. Poor Alignment or Worn Bearings? Poor tire wear including feathering and premature wear. Feathering could indicate trouble with the toe angle while wear on just one side of tires is caused by excessive camber and/or toe. Often when there is difficulty with caster angles, you’ll notice difficulty steering or a slow return of the steering wheel to the center and may pull to the left or right. An off-center steering wheel is evident of poor alignment. Vehicle pulls to the left or right when driving. Noise such as snapping, popping, or clicking often heard when making sharp turns. Grinding sound due to damage to the roller or race when turning or a shift in load. Humming or rumbling sound when driving straight but worsens when turning the steering wheel, often the opposite side of the damaged bearing. A vibration or wobbling sensation can be felt if there is trouble with a clamp with severe mechanical damage. At Sun Devil Auto, we can help improve your ride from bumpy or crooked to smooth and comfortable. If you notice tire wear, just had your tires replaced, or your vehicle is pulling in either direction, bring your car to our ASE Certified Technicians. Our alignment machines are of superior quality and make aligning your wheels quick and easy. If your alignment is in order and you suspect a wheel bearing has failed and requires replacement, our technicians have the knowledge and know how to replace them and get you back on the road. Stop spinning your wheels looking for quality auto care when you can choose Sun Devil Auto for all your automotive needs!